It started with a call from the Associated Press and a question: What’s a good recipe for a vegetable side dish that features common pantry products? In 1955, the AP, like other newspapers and magazines of the time, was running a feature of an easy-to-make Campbell’s Soup side. The question came with a caveat: the recipe had to be built around green beans and Campbell’s Cream of Mushroom Soup, two items most Americans regularly had in their homes in the ’50s. The request fell to the Campbell’s Soup Co. test kitchen in Camden, New Jersey, an arm of the company that focused on coming up with recipes for its products. Dorcas Reilly, a supervisor for Campbell’s home economics department, was tasked with leading her team to figure out what could be done. The group would test and grade recipes repeatedly. Only a perfect score would qualify it as ready to go. In November of that year, Reilly and her team settled on what would be first known as “the Green Bean Bake,” an easily adaptable six-ingredient recipe of green beans, cream of mushroom soup, milk, soy sauce, black pepper and French fried onions that takes 10 minutes to prep and 30 minutes to bake. When Campbell’s started to put Reilly’s recipe on the cans of its cream of mushroom soup in 1960, the popularity of the dish hit new heights. More than 60 years since the dish was invented, green bean casserole is a Thanksgiving staple, with an estimated 20 million-plus American households expected to serve it this year, according to Campbell’s. 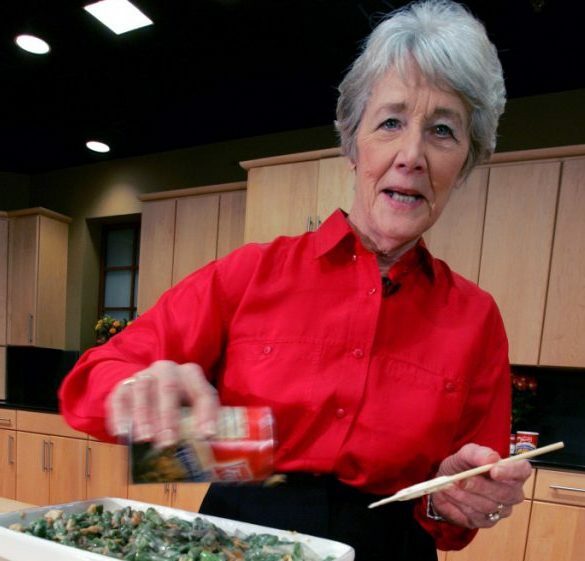 Reilly, an influential innovator of beloved comfort food in the U.S., died on Oct. 15 of Alzheimer’s disease in Camden. She was 92. A visitation and celebration of her life will be held on Saturday in Haddonfield, New Jersey. Born on July 22, 1926, Reilly was raised in Camden. She would become one of the first members of her family to attend college, earning her bachelor’s degree in home economics from the Drexel Institute of Technology, now known as Drexel University, in 1947. She headed to Campbell’s in 1949, where she was one of two full-time employees developing recipes for the company’s home economics department. With the economy flourishing in the ’50s, there was an appetite for meals that were easy to make, delicious and cheap. Reilly found success with a tuna noodle casserole, a tomato soup cake and a Sloppy Joe made from tomato soup. But things were different when it came to her most notable side dish. Campbell’s has estimated that 40 percent of its cream of mushroom soup sold in the U.S. goes toward making Reilly’s green bean casserole. And millions of Americans have adopted it as part of their Thanksgiving celebrations. “Thanksgiving is the Super Bowl for green bean casserole,” Jane Freiman, director of Campbell’s Consumer Test Kitchen, told NBC’s “Today” in 2015. Reilly’s cuisine hit new heights in 2002, when Campbell’s donated the original recipe card written by Reilly to the National Inventors Hall of Fame. The yellow recipe card resides in the same place as Thomas Edison’s lightbulb and phonograph and Enrico Fermi’s first controlled nuclear reactor. Though she was known for her work, Reilly had said how “food should be fun and food should be happy.” It was a mantra she carried with her in bringing green bean casserole to the Thanksgiving table. And millions would follow.